Art above NYC. Water above all. Water tank art for water awareness. What Is The Water Tank Project? 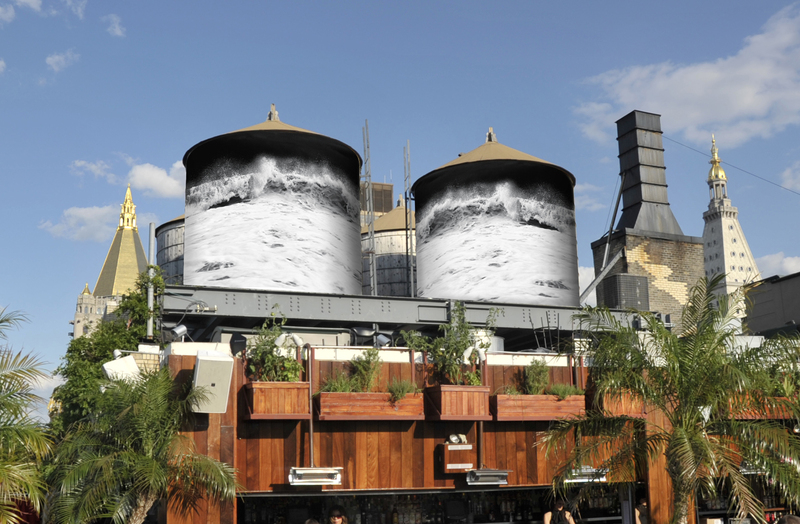 Launching summer 2014, The Water Tank Project will transform the New York City skyline. 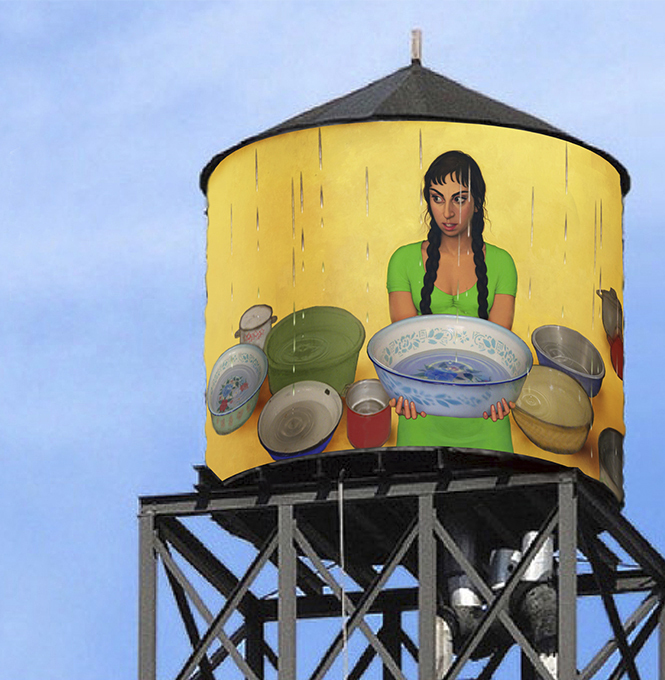 Artwork by acclaimed artists and New York City public school students will be wrapped around rooftop water tanks throughout the city, celebrating the talents of established and emerging artists, and calling attention to the global water crisis. The Water Tank Project is part art exhibition, part awareness campaign. For the duration of the project, art above will be complemented by action on the ground through educational programs, public tours, social media activities and a symposium dedicated to inspiring fresh views on global water issues. Our aim is to produce art as social intervention, to inspire awe and joy, to educate, and to alter attitudes and habits among those who experience The Water Tank Project, ultimately creating meaningful and long-lasting change. 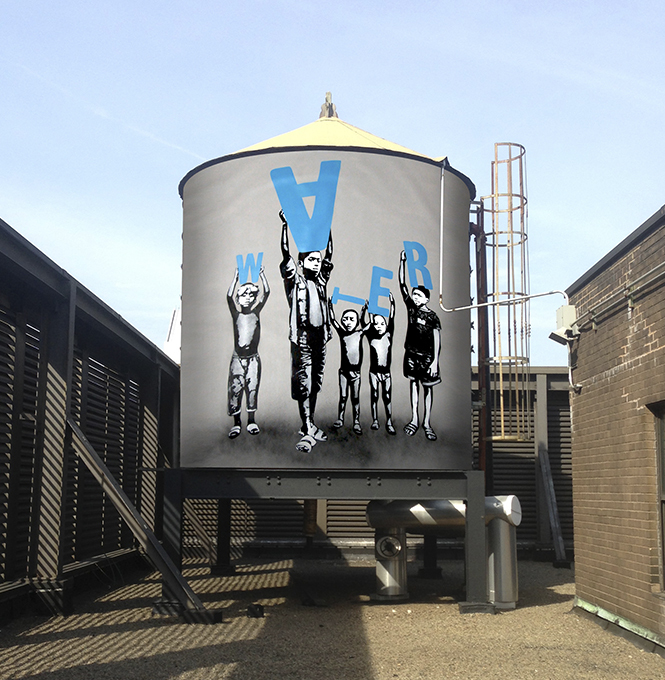 The Water Tank Project is the inaugural initiative of Word Above the Street, a non-profit dedicated to fostering environmental awareness and social advocacy through art. Mary Jordan is an artist, filmmaker, and activist. She is also the founder of Word Above the Street and Creative Director of The Water Tank Project. Jordan has directed several films, including the award-winning Jack Smith and the Destruction of Atlantis. She has screened films at festivals including London Film Festival, BFI (British Film Institute), International Film Festival of Rotterdam, Los Angeles Film Festival, Seattle International Film Festival, Copenhagen International Film Festival, Sydney International Film Festival, and the Pacific Film & Television Commission. Her work has been theatrically released and exhibited at New York’s Film Forum, on the Sundance Channel, and on multiple network stations. Jordan’s upcoming features include films on artists Ed Ruscha and Richard Prince, and Angels of Light, a video about the 1960s experimental performance group. A tireless champion of human rights, Jordan has also produced award-winning documentary work in Burma, Africa, Indonesia, and India. She has worked with Médecins sans Frontières (Doctors Without Borders), the Millenium Foundation, the International Center for Human Rights and Tolerance Education, and was chosen by the Children’s Movement Organization to direct their feature documentary on the war-torn children of Bosnia. As founder of Word Above the Street, Jordan spoke at New York’s 2011 Festival of Ideas, and at the PolicyLink Equity Summit 2011 in Detroit. That same year Jordan founded Estonia’s Kau Arts Center, where she is also Creative Director. Natural Resources Defense Council (NRDC); World Resource Institute (WRI), Columbia Water Center (Earth Institute); Waves 4 Water; STUDIO IN A SCHOOL; Newmark Knight Frank; ABC Realty; ArtBase; Bettina Equities; Brown Harris Stevens; The Durst Organization; Fenwick Keats Realty; Forest City Ratner Companies; Halstead Property; Malkin Holdings; Manhattan Skyline; REBNY; Jack Resnick & Sons; Rudin Management; RXR Realty; Two Trees Management; Vornado Realty Trust; Time Equities Inc.; The Shed. Agnes Gund AG Foundation; Lily Auchincloss Foundation, Inc.; the Booth Ferris Foundation; The Andrea & Charles Bronfman Fund at Brandeis University;The Ford Foundation; Deutsche Bank Americas Foundation; The Rockefeller Foundation New York City Cultural Innovation Fund; the Hauptman Family Foundation; The Ronald and Jo Carole Lauder Foundation; The Lear Family Foundation; The Dorothea Leonhardt Foundation; The Toby Devan Lewis Philanthropic Fund; Solutions, A Donor Advised Fund at Aspen Community Foundation on behalf of Adam Joseph Lewis; Rockefeller Philanthropy Advisors; ACE Foundation. Bettina & Donald L. Bryant, Jr; Elizabeth K. Belfer; Agnes Gund. Bauer Family; Stephen and Claudine Bronfman; Pippa Cohen; Bobby Foshay Miller; Amanda and Glenn Furhman; Will McDonough; Michelle Smith; David Teiger. The Water Tank Project believes that the seeds of meaningful change take root when nourished by education. To that end, The Water Tank Project collaborated with Children’s Movement for Creative Education (CMCE) to develop ‘Trace the Tap’, a water-focused curriculum that encourages students to explore the importance of clean water from biological, environmental, cultural and economic perspectives. ‘Trace the Tap’ reveals to students the bigger picture of a resource they encounter every day and has the potential to empower a new generation of water stewards. It guides them to develop an understanding of the vital importance of water in supporting life, and gives them the tools to investigate local, national and international water issues. The knowledge acquired through this program will give young people a foundation on which to build leadership roles and ultimately educate their communities about one of the most pressing concerns of our time. This twelve-week supplemental program, supported by both the Department of Education and the Department of Environmental Protection, will be offered through our website. In collaboration with Studio in a School, The Water Tank Project engaged New York City public high school students in a competition for the chance to see their artwork featured on a water tank. With the launch of The Water Tank Project this summer, a selection of student artwork will be displayed alongside art by some of today’s leading artists, strengthening the community’s involvement and reinforcing its connection to the project. The Water Tank Project believes that providing an educational platform within a public art project is crucial to fostering dialogue about critical issues. The artwork produced by student artists for The Water Tank Project reveals a fundamental grasp of the countless issues surrounding water, and gives hope that a new generation of water stewards will help protect our most vital resource. The Water Tank Project has recently teamed up with Brooklyn-based production company The Shed, which, with help from our sponsors, will be producing a documentary around the project along with a series of shorts for the web. Having a film component will broaden our impact and give us the ability to reach anyone with a computer, TV or smartphone, not just those who live in cities where tanks will be on display. As New York will be the first city to host the project it will be the primary focus and backdrop of the film. In the months leading up to the first unveiling of the tanks we will closely track the life of the project, speaking with key players, supporters and, of course, many of the artists themselves. We will also secure interviews with leading voices in the fight for ethical water reform on a global scale. Finally, we will hear from those most closely affected by the lack of access to clean water, and travel to Africa where the idea for The Water Tank Project originated. In spring 2014, the New York City iteration of The Water Tank Project will be the drop that causes ripples worldwide. Cities around the world use tanks to store clean drinking water for everyday consumption. Specialized tanks help us collect rainwater and prepare for emergencies. 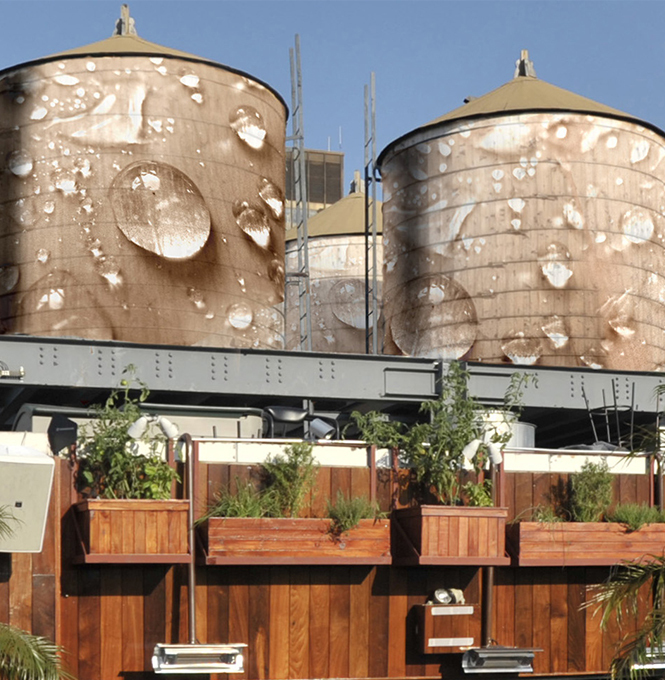 The Water Tank Project hopes to take advantage of these often overlooked structures and draw attention to their precious contents in cities and venues around the world. 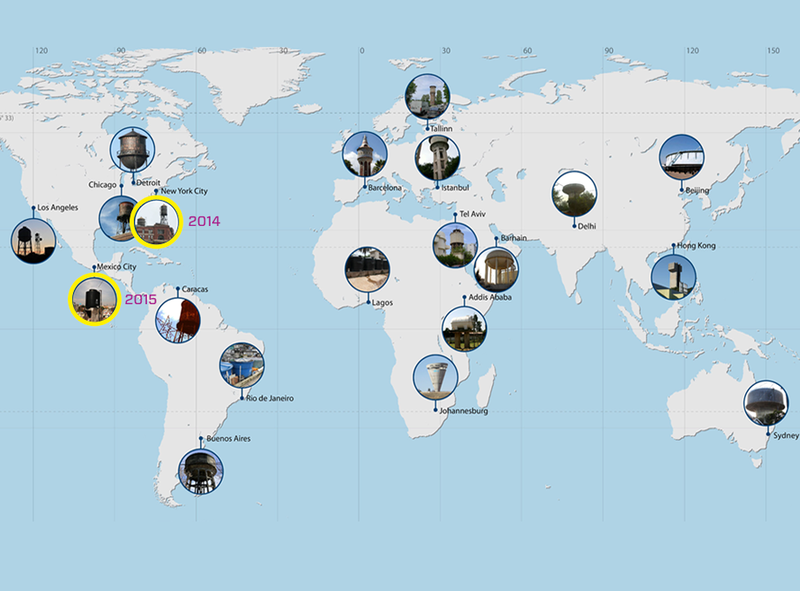 This map illustrates only a few of the cities across all five continents that possess water tanks waiting to be transformed into beacons of environmental and artistic activism. TANK YOU © 2014 The Water Tank Project. All Rights Reserved.